After so very many painstaking hours of pattern searching, pattern buying, remaking a pattern from scratch, and making mock up dresses, I finally settled on a design I liked, made the final tweaks to it, and went with it. I love how it turned out. I don't think I would quit my day job to make wedding dresses, but I'm glad I did it for myself. I fell in love with the off white rough raw silk when I saw it in the fabric store. I thought the pattern I made would lend itself very well to this silk I loved, so I took the plunge, and emptied my wallet on the silk. I think it was a good move. 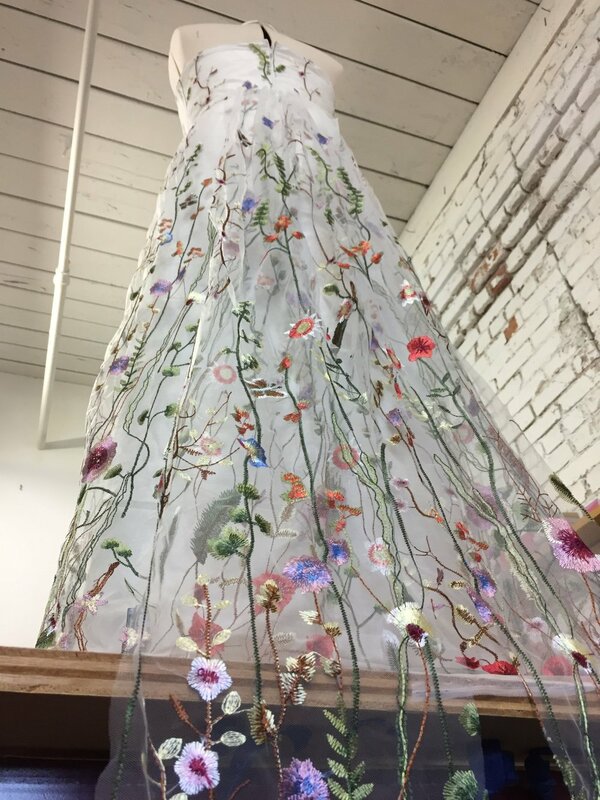 In the meantime, I had ordered the embroidered flower tulle from Hong Kong, and was quite nervous about it arriving in time, or getting held up in customs, which, as we know, happens every now and then. When all was said and done, My pattern was made in time, I had enough muslin for sample dresses, and all silk and tulle was in hand with plenty of time to spare. After 3 mock up muslin dresses, Expletives galore over darts and mis-matched..ahem...breast sizes, I finally ended up with a dress and fit I liked. I think the dress came together very well. I loved the flow of the greenery and the flower stems along the dress. And after walking through the marshy low tide in my gown, sweating up a storm while dancing, and walking along the beach for an evening beach bonfire, I even love the mud and dirt at the bottom of my dress. I'm contemplating having it cleaned or not! Above all else, I especially love the man behind the reason for having to make a wedding gown in the first place. Although the daily bump and grind doesn't change much once married, I do find myself contemplating life in general a bit more often now, and how to further my career and business. I'm thinking of diving into teaching sewing, and taking on custom sewing projects. I find so much pleasure in creating unique and individual objects for different people's homes, tastes, styles, etc. It's always rewarding and refreshing to be asked to make cushions for a sun room patio, or to teach a child how to sew. I think I'm going to dive in and do it. If you're local, and you have a sewing project that's waiting to be done, an old ottoman that needs a refresher, window treatments, or even if you would like to learn how to sew, (or make your own wedding dress)!! drop me a line!